The all-new Renault KWID gets a dozen of reasons for breaking the current entry level records. It gets everything which was desired by a car buyer in this segment and not even that, it offers those facilities which were once considered as a luxury to a car. Its potential can be judged from the passion in the eyes of those who have planned for the car since its first look arrived. The KWID comes with SUV inspired styling, making it the most distinct product in its segment. Its bold statement can be judged from its rough and muscular appeal. It ranks good when it comes to connectivity features as it comes with Bluetooth, AUX and USB options. The ease is further aided with 22.4 litres of combined storage inside the cabin and a class leading 300 litres of boot space. The convenience is further boosted with a 2422 mm of wheelbase, providing spacious interiors. The entertainment is never left back with its 2-DIN MediaNAV touchscreen system, the first of its kind in its class. The digital instrument console adds to further style and utility as no other car in or above the segment carries the same functionality. The car gets a powerful 799cc engine producing 53.2 BHP and 72 NM of torque, which again is a class leading performance figure. It returns a 25.17 kmpl of mileage and gets a 2 year/50,000 km warranty. The KWID has a raised stance and gets a 180 mm of ground clearance for an India friendly. It will get an optional driver airbag for a safe journey every time. The expected pricing of INR 3-4 lakh has made the KWID a dream come true for many aspirants. 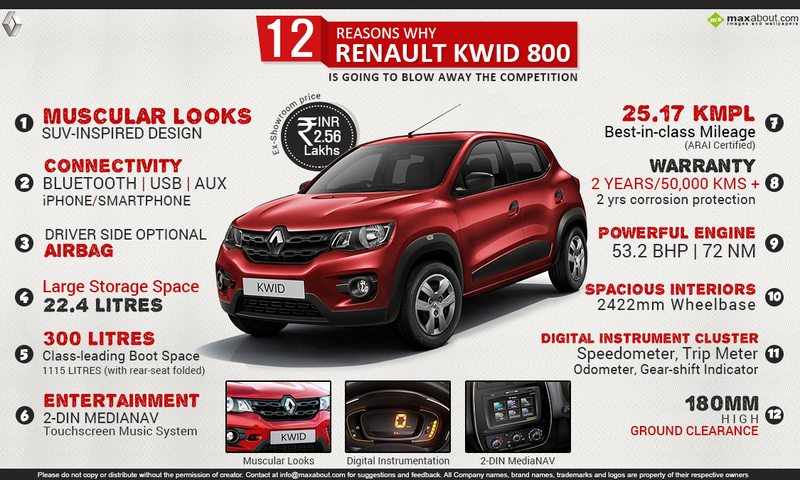 Click here to know more about the Renault KWID 800.